BENJAMIN FRANKLIN arrived in Paris on the 21st of December 1776 to become, with Silas Deane and Arthur Lee, one of three American commissioners sent to France by Congress in hope of obtaining aid from that country. In March 1777, Franklin established himself at Passy, a charming village outside Paris. Among his duties was the frequent, time-consuming one of answering requests for letters of introduction or recommendation to accompany travelers or businessmen to America. So it was that Franklin was asked, in December 1777, for such letters by John James(Jean Jacques le jeune) Doerner, a French banker, who planned 'to establish a House of Commerce at Charles-town North America.' 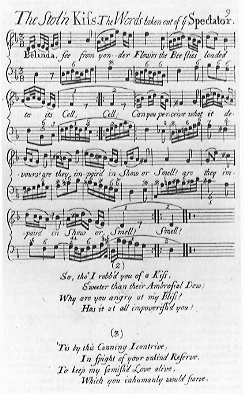 The original manuscript of the request is preserved in Special Collections (MS777600), a gift through the Friends of the Dartmouth Library of Mr. Perc S. Brown. 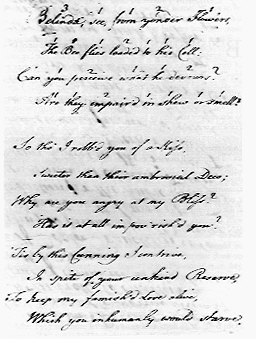 This utterly prosaic piece, measuring to 5 x I6 cm., would be of only minor interest, were it not that on the reverse there is an untitled love-poem, written in ink by Franklin; it consists of three quatrains of octosyllabic lines with numbers superimposed on the words of the first quatrain only (Fig. 1). Can you perceive what he devours? Are they impair'd in shew or smell? Why are you angry at my Bliss? Has it at all impov'rish'd you? Which you inhumanly would starve. These possibilities would still leave the question of the syllable count. It may simply have been to check whether the count of each line added up to the total of eight. In prosody of eighteenth century poetry, strict adherence to a consistent syllabic-count was paramount, and poetic contractions (elisions) were much used to this end. In this regard, Franklin elided 'Flowers' to 'Flow'ers,' which would make for a two-syllable word instead of `Flow'rs,' a one-syllable one as required to come to a total of eight syllables for the line. Of interest is that Franklin called the worker honeybee by the wrong, male, gender: 'his cell' and 'he devours,' the text of the song using 'its' and 'it.' Aristotle's surmise of a king-bee as the governor of the community of the honeybee (Apis mellifera) was not refuted until the late sixteenth and early seventeenth centuries. In England this was done by Charles Butler in his famous The Feminine Monarchie, which was published at least four times in English and several times in Latin. 8 Butler observed that a queen-bee rules the hive, while the drones are male. In 1637, Richard Remnant established that worker honeybees are female.' 9 Franklin must have been aware of these observations at the time he copied the poem. This would imply that he made the change intentionally, identifying with the bee, but to what purpose? This small item, then, allows a glimpse into the friendship of the septuagenarian American commissioner and his favorite among the younger ladies of Paris. Acknowledgments: I thank Mrs. Claude A- Lopez, associate editor of The Papers of Benjamin Franklin, editor of Volume 27, author of the incomparably delightful Mon Cher Papa: Franklin and the Ladies of Paris, for corrections and suggestions. Also thanks to Mrs. Claire B. Packard, Mrs. Patricia A. Carter, and Mrs. Marianne H. Hraibi. Professor David Wykes clarified for me the use of elision in eighteenth century poetry. 1. Benjamin Franklin, The Papers of Benjamin Franklin ed. William B. Willcox et al. (New Haven: Yale University Press, I959-)* 25: 300. 2. Franklin, Papers, 24: 170. 3. Claude-Anne Lopez, Mon Cher Papa: Franklin and the Ladies of Paris (New Haven: Yale University Press, 1966), 32, 43, 118. 5.Benjamin Franklin, The Autobirography of Benjamin Franklin ed. Ralph L. Ketcham et al. (New Haven: Yale University Press,1964), 61-62. 6. William Hayes, Twelve Arriets or Ballads, and Two Cantadas (Oxford, 1735). P.9, song 8. This was the first music published by Hayes, who was professor of music at Oxford from 1742 until his death in 1777 and was succeeded in that post by his son Philip (1738-1797).See also The New Grove Dictionary of Music and Musicians, ed. Stanley Sadie (1980), and Alexander Meyrick Broadley, William Hayes. . . . Philip Hayes. . . . Catalogue of their Composers (Bridpor. 1900). Performed by a Group of Artists under the Direction of Henry S. Drinker. Program Notes by Gilbert Chinard,' Proceedings of the American Philosophy Society 100, No. 4 (August 1956), 331-337. 8. Charles Butler, The Feminine Monarchie or a Treatise concerning Bees the due Ordering of them...(Oxford: Printed by Joseph Barnes, 1609). This first edition is available in the microfilm of the Short Title Catalogue books for the period 1475-1640, reel 725, no. 4192. The subsequent appearances in the seventeenth century are also available in microfilm. 9. Richard Remnant, A Discource of Historie of Bees (London: Printed by R. Young for T. Slater, 1637). Available in the rnicrofilm edition, Early English Books, 1475-1640, rel 934, no 20879. 11. Lopez, Mon Cher Papa, 45. 13. Lopez, Mon Cher Papa, 58.